The Old Schoolhouse (TOS) Homeschool Crew asked me and some of my crew members to review Salem Ridge Press. You’ll want to read the other reviews, posted here. Salem Ridge Press is the heart and brain of Daniel Mills. 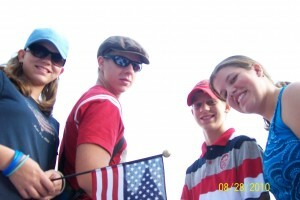 Daniel graduated (homeschool) in 2003 and started his republishing company in 2005. It’s foundation is Philippians 4:8, “Finally, brethren, whatsoever things are true, whatsoever things are honest, whatsoever things are just, whatsoever things are pure, whatsoever things are lovely, whatsoever things are of good report; if there be any virtue, if there be any praise, think on these things.” A company standard with God’s seal of approval. Exceptional! Books republished by Salem Ridge Press have been chosen from fine children’s literature of the 1800’s and 1900’s. 12 titles have been republished in the Emma Leslie Church History series. 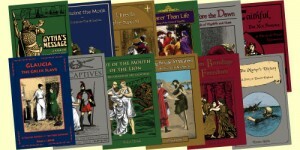 World History, American History, Adventure and Allegory are also available. Content is thoroughly reviewed and may be slightly edited to meet the standard of moral and Godly character, before it is republished. They are re-typecast, making the print and layout easier to read. Most of these books are historical, period pieces; therefore, the language may be more difficult to read, at first. Daniel and his team ease the transition-through-time by adding historical notes, timelines, definitions and maps to each book. Books are listed at SalemRidgePress.com in alphabetical order, by time period & location (my favorite), by author and according to age range. Price per book is $14.95 to $24.95. You can also contact the company at: Salem Ridge Press LLC, 4263 Salem Drive, Emmaus, PA 18049. If you sign up now for their quarterly newsletter you receive a chance to win a free book! I’ve often told my children… garbage in = garbage out. Daniel and Salem Ridge Press make… wholesome in = wholesome out… a real possibility. Sometimes, God may reward us for our good works, but most of the time, I think, He does things for us just because He loves us and He can. August 2010 was a time of out-right, clearly-evident, blessing-upon-blessing, in my house, and not one of us did anything extraordinary to deserve it! We did not set a course to fast longer and pray more; there was no uncommon repentance or life-rocking revival. 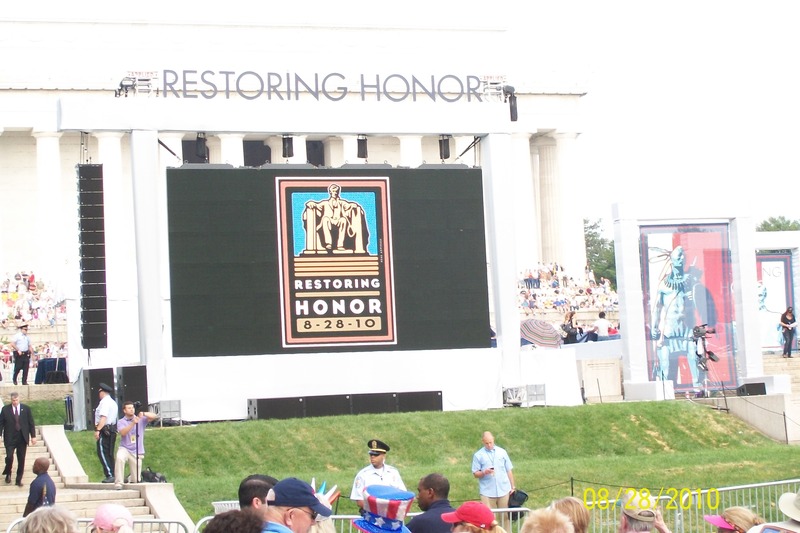 There was a rally in Washington, D.C. on 8-28-2010 called Restoring Honor. It was organized to bring people together from all over America, to thank our soldiers and restore honor to their gift of service. We also saw it as a time to come together to ask God to restore our country, under His care. From the moment we heard about it, my older children and I wanted to attend it. We first heard about it on Glenn Beck’s program. With 9 of us at home, I looked at our budget, juggled and jiggled; attempted to manipulate it and then, in good conscience, decided it just wasn’t feasible. I don’t even think I prayed about it, at that time, and I certainly wasn’t approaching my husband about it, when our ends barely ever meet anyway. It was evident to me that going on such a trip was not a necessity and like most everyone I know, just meeting the needs of our large family was pushing it. Not a lot of discussion was needed, to explain why we weren’t going. My family lives firmly in reality and we all knew this wasn’t the type of thing that people like us actually do. =) Don’t get me wrong, we enjoy our life. There are lots of free and inexpensive things to do together. We live a few miles from Lake Lanier, with free access to a little sandy beach, water and tons of Georgia clay! 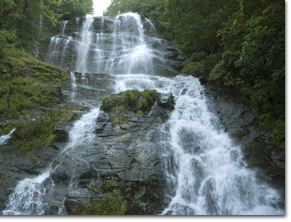 Georgia is home to many, beautiful water falls and inexpensive state parks. We love to hike and camp and picnic. Amicalola Falls is stunning! Sometimes, when we would watch Glenn Beck and he would enthusiastically talk about the rally, I would notice the children speak a little wistfully, “Oh, that would be so cool!”, “I wonder who else is going to be there?”, “Can you imagine, actually seeing The Lincoln Memorial or The Washington Monument?” They were just talking and I was just observing them. I don’t think they even realized what I was seeing. At some point, I started to speak, a little wistfully, to my Father God. “It really would be so cool, God!”, “Just one time, Lord, I’d like them to experience the other possibilities of life.” Sort of like, an occasional, brief, conversation-in-passing with a trusted friend. Topic: Sponsorship or Scholarship available from anyone? I’ve never asked anything like this before, but…going with the “…you have not, because you ask not…” motto ~ would anyone like to sponsor (yes, pay for) my four teenage children and me to go to the rally? I have a small car and I’m willing to drive from Georgia to D.C., …the flesh and heart is willing, but the bank account is impossibly weak. We watch Glenn Beck every day as part of our history/government/economics class and we so want to participate “on the ground”. I HAVE a 14 y.o. son, 16 y.o. daughter, 18 y.o. son and 20 y.o. daughter that have a heart for God and America. What I do NOT HAVE is gas money and a place for us to stay. We have been praying about this since it was first announced and nothing has happened. I figured the worst that could happen with this plea is being told “no” and I can handle that. My example is one of pressing in and not giving up. So, there you have it. Any one or more want to send us in your place? God bless and keep each of you and may He bless America in answer to our cries. This is the actual post copied from the Restoring Honor Rally discussion board. It is still as embarrassing as it is bold, even though I know how God used it to accomplish His purpose. I can say that three weeks of wrestling with God and wanting things my way, did me no good. 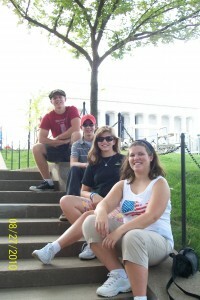 As I typed, I felt compelled to get my children to Washington, D.C. I was challenged to obey, let it go, and let God, be God. I was reminded that a little faith can move a mountain. I posted this note and then I told my husband and children what I had done. I wasn’t sure what they would think of me. As I re-read it, I discovered I was torn, believing no one would respond in any way and so hopeful that just one person, with-more-money-in-the bank-than-they-knew-what-to-do-with, would see it and make us their “charitable contribution”. That wasn’t one of God’s ideas, either. At this point, I began to pray, believing. After I “gave in” and asked for help, my idea was of a rich-uncle-with-a-soft-heart type benefactor with no sacrifice involved. God’s idea was to move across the hearts of those with little and some with even less. Within days we had notes of prayer and encouragement and calls of financial support. The first woman that called me, asked what the needs were to get us to D.C., and then pledged to pay for our hotel room and gas. She encouraged me to accept what God was doing and said maybe we were someone’s “Pay It Forward“. Every comment to the board was not a positive one. I was hurt and embarrassed by some comments that were made, especially in such a public forum, and where my children could read them, but the support that surrounded me, from people I’ve never met personally, was like nothing I’ve ever known. They buoyed my spirit when it was weak. My emotions were on the edge of my nerve endings. I read nearly every comment, out loud to my family, through tears. I could not fathom how God was using the “thread” on the rally board. One man shared his personal testimony with me. He had posted several comments of doubt and accusation. In public forum he called me a “scammer” and he believed it. I felt broken and weary of trying to explain or defend; so, I simply blessed him, in open forum, then I let it go, and let God, be God. He says God changed his heart and changed his mind. He became one of my dearest champions. There is no balm to soothe a wounded soul, like the love of God. Another was reminded of her faith that had been buried under discouragement and disillusion in the state of our country. She saw Faith, Hope and Charity alive in American hearts and her spirit was renewed! Many small amounts came together to make one big difference. 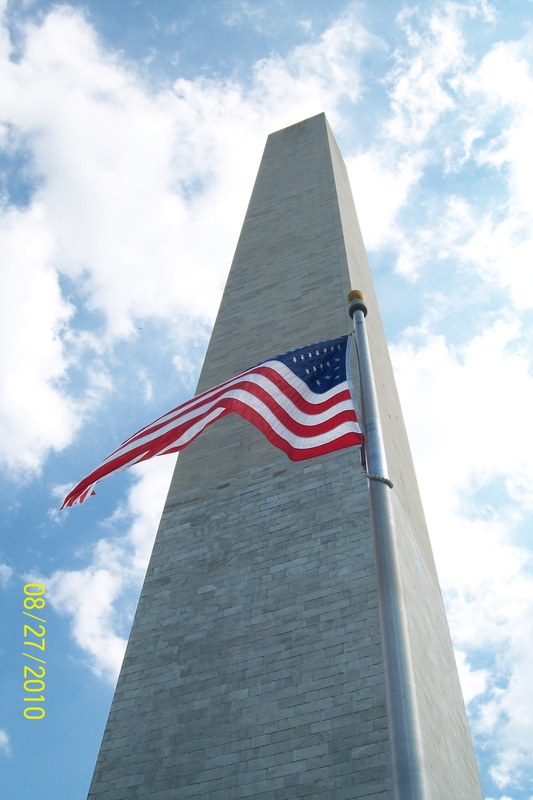 God had provided a way, where there seemed to be no way, that would allow us to go to the Restoring Honor Rally in our nation’s capitol! We had pledges and cash to cover Metro fares, hotel parking fees and gas. One sent $10 and another sent $5. Someone pledged to give $25 and then wrote the check for $28, in honor of Glenn Beck’s show on 8-16 about a donation of 8 cents and referencing the Biblical story of the widow’s mite. God stirred hearts and every financial need was met, nothing more. To the degree that, we had a $30 pledge to pick up in D.C. after we arrived. Seemed simple enough in theory, but the rally was huge, everything was busy and we didn’t make the connection. Never the less, I had enough money to fill the car at our last stop before home. God knew I wouldn’t need an additional $30; so, I didn’t get it. It was nice to let go, and let God, be God. I can say that I saw God move a mountain. I watched in awe, as He poured deposits of faithfulness in to my children’s lives. I don’t know what is in their future, but I do know, that when they are pressed, they will remember this time. They will know, that they know, that they know, that their God is able to do all things! When doubt wants to creep in, they will be able to draw from a rich, personal history, of His faithfulness. Math is not my favorite dish. It wasn’t when I was learning it and the feeling wasn’t any different when I started teaching it. It isn’t a flavor I care for. That may be about to change though, because of Math Tutor DVD and Jason Gibson. My children and I recently used The Pre-Algebra Tutor: Vol. 1 and The Texas Instruments TI-83/TI-84 Calculator Tutor. The TI-84/TI-83 tutor teaches you how to use all of the functions of the calculator by actually working example problems, not just handing you a manual. Simmer through 8 hours of teaching, covering 37 sections and you can’t help but absorb and improve your usage. 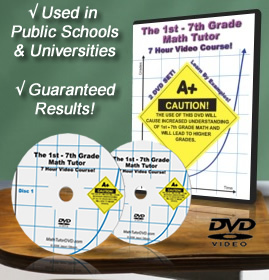 These DVD’s are available at MathTutorDVD.com, or you can call: 1-877-628-4383 to place your order. You pay shipping/handling on the 1st DVD only. 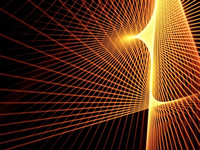 MathTutorDVD.com has Basic Math for elementary and middle school, Algebra (Pre-, 1, 2, and College level), Geometry, Calculus (Pre- and Advanced), Physics and more. Each course is seasoned with working examples, multiple servings of problems and step by step solutions. Jason begins with small morsels of information and builds concept upon concept. The two courses I reviewed, The Pre-Algebra Tutor: Vol. 1 and The TI-84/TI-83 Calculator Tutor are currently on sale for $26.99 each. In my opinion, all of the DVD’s are moderately priced for the portion you receive. $19.95 per month (with the option to cancel at any time) will give you immediate online access to 170 hours of tutorials, download worksheets, participate in discussion forums and generally feast on mathematics, if you choose. We like the taste of Math Tutor! I’ve added it to our curriculum menu for this year. I ordered Math Help: 1st – 7th Grade Math Tutor and 1st – 7th Grade Math Tutor Companion Worksheet CD (500 pages of worked problems AND solutions.) Looks like a no-risk, guaranteed, recipe for success! I’ll keep you updated on our progress and if you order a course yourself, let me know what you think of it.